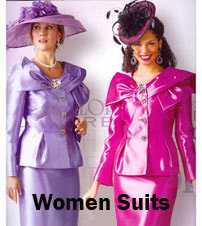 One button suits are sometimes called single button suits. One button suits are the sign of elegance and class One button suits are very popular these days in both formal and work situations. 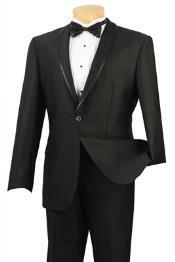 One button mens tuxedos have always been a popular choice for formal events. 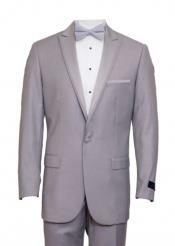 1 button tuxedos are very elegant looking but why not try out a 1 button suit to spice up your look in the office? A black one button slim fit suit is not just limited to tuxedos anymore and you really should give one a try at your next business meeting. 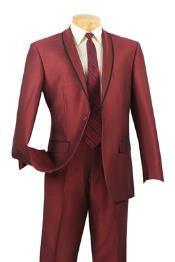 Single button suits come in a variety of colors and styles that will fit any budget! 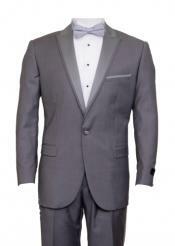 One button suits for men can be found in a variety of styles to fit every event that you may be invited to attend. A shawl lapel is always a great choice for a formal event. 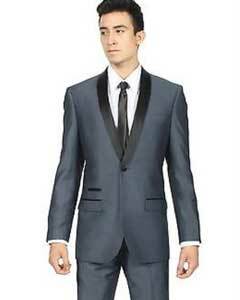 However, a mens one button suit does not have to be worn as just a tuxedo anymore. 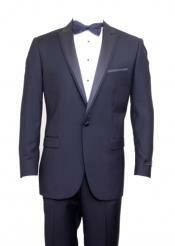 For example, a one button business suit and one button business blazer for men are also available and will set you apart from the crowd in the boardroom. Whether at play or at work a one button blazer is one that any man should have in his wardrobe. 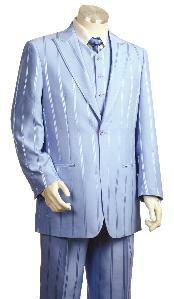 A peak lapel is also a common feature of a one button suit. 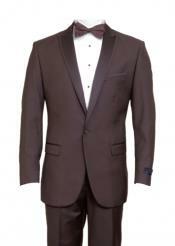 A peak lapel gives a more elegant and refined look to any suit and a one button suit is no exception. 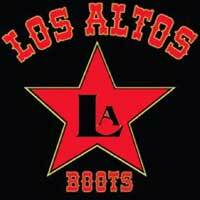 One button suits have always been popular and are gaining in popularity each year. One button suits are the epitome of fashion and style no matter what your event may be, so wear it without reservations! 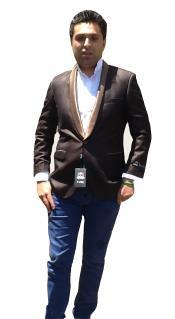 A business suit is nice, but a one button suit can make you look extra suave and debonair! So whatever one button suit that you are looking for, look no further than mensUSA. One button suits can be found in a variety of colors also at mensUSA. 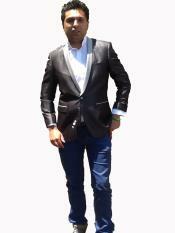 Black one button suits are some of the most popular available on the planet. 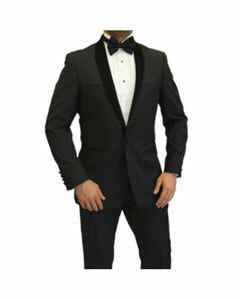 These black one button suits are formal and elegant looking and have a great degree of sophistication and style. 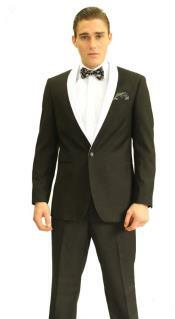 A one button black suit can also be worn at occasions like a black tie event. 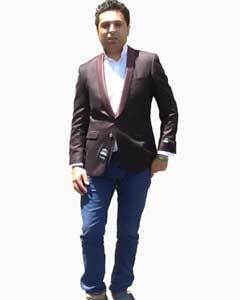 One button suits can be worn for business as well and come in all the materials that you will find a nice mens business suit in, and at a fraction of the price you would pay in the finer shops of New York and Paris. 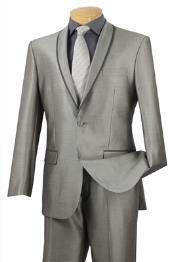 For example, some of our finest wool 1 button suits can be had for under three hundred dollars here at mensUSA. 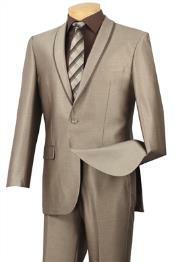 Even cheaper versions of the highly styled one button suits can be purchase for under two hundred dollars in polyester or a wool blend. For example, all materials of suits are available at mensUSA for a fraction of the price that you would pay in New York City or Milan. Shop at mensUSA for any one button suit and the quality and customer service will impress you so much that you will come back again and again! 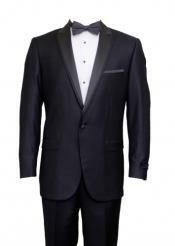 You have found your one stop shop for mens formalwear and business attire here at mensUSA. Once you have bought from mensUSA you will keep coming back for more and more, especially if it is a one button suit that you are looking for! One button suits make a statement without ever opening your mouth. 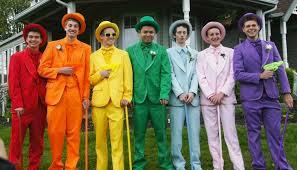 When you walk into a crowd you will be set apart by your fine looking one button suit. The best way to wear your one button suit from mensUSA is with a finely pressed dress shirt which is also available at mensUSA. 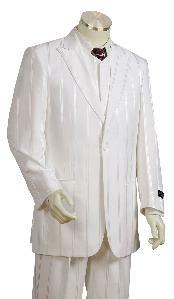 A one button suit is best worn with a shirt and tie to achieve the best looking suit that you could ever have imagined. 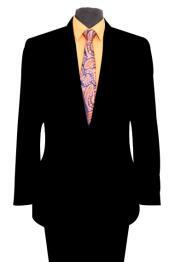 Ties are also available at mensUSA and can be found in a variety of colors and styles. You are only limited by your imagination and style here at mensUSA since we have all the most popular colors that can be found today in the fashion industry. 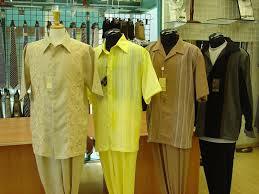 Only the best in fashion will work for you and can be found at mensUSA!